Although it weighs 7,500 tons, the latticed dome that sits atop the Louvre Abu Dhabi appears to be floating. Its porous structure, comprising 7,850 unique aluminum stars and producing the much-cited “rain of light,” which dapples down to the 55 gleaming white buildings below it, is an architectural masterpiece. Designed by Jean Nouvel, it is the first piece of art that a visitor to the new museum encounters, and it is nothing short of breathtaking. Inside, the content and curation is just as impressive, with a radical presentation that dissolves the categories museum-goers are familiar with and displays together objects from similar eras but from different geographies to underline the commonalities of human experience. It is for this reason that the Louvre Abu Dhabi is being lauded as the world’s first universal museum. It is a problematic term, wide open to criticism, but walking through the gallery halls and seeing objects of art from different cultural origins in the same space serves to create a global narrative. Jean Francois Charnier, the scientific director of the institution, who oversees the curatorial team, describes the museum’s content as being laid out over 12 chapters. The literary reference is pertinent because every time a visitor makes moves from one hall to the next, it is as if a new page of history is being turned. In this way, the museum maps out a smooth journey from the prehistoric ages to the present day. The entire experience is summarized in the first room, titled the Grand Vestibule, which acts as a prologue and a microcosm for the rest of the museum. The light-bathed room with distinctive floor patterns plotting out marine charts and a jagged line of the coastline of the UAE, is designed to encourage the visitor to feel like a maritime explorer, metaphorically washed up on the shores of Abu Dhabi and about to enter a brave new world. 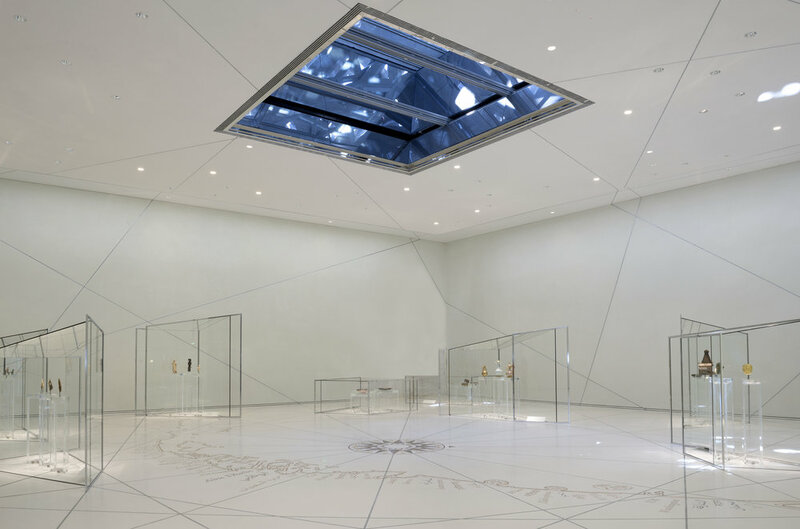 Inside this large introductory space are nine angular glass cabinets displaying groupings of three similar objects from distant civilizations. An ancient Egyptian statuette of the goddess Isis nursing her son Horus, for example, stands next to a medieval French sculpture of the Virgin and Child and a 19th century maternity figure from Congo’s Yombe culture—all displaying the love of a mother for her child. Other cases contain praying figures, gold masks, water ewers, and men on horseback. The labels are informative without being didactic. The four interconnected wings of the museum continue to delineate the story of human civilization beginning at around 8,000 B.C. when communities first began to settle. The first piece a visitor sees is a monumental statue with two heads, that was discovered in Jordan’s Ain Ghazal and dates to 6500 B.C. It stands at eye level and is beautifully lit and utterly compelling. Its strange form is seen repeated in other vitrines with pieces from ancient Cyprus and Mesopotamia, and immediately this unexplained double-headed character becomes even more intriguing. The interconnected second and third gallery halls inside the Louvre Abu Dhabi. Image taken by Anna Seaman during the press preview, November 7, 2017. The vast halls of the second and third galleries include examples of the world’s first great powers. An imposing figure of Ramesses II, pharaoh of Egypt, is flanked on one side with a statue of Gudea, the ruler of the state of Lagash in Southern Mesopotamia, and on the other by a breastplate worn by the rulers of Bronze Age in Europe. Behind them, in the next hall, the gleaming marble figures of ancient Greece remind us of a future yet to be formed. Further along, a second-century standing Bodhisattva from Gandhara in Pakistan stands alongside a Roman orator from the same period. The match-up is stunning. Both statues, of remarkably similar size and form, exhibit clear influences from ancient Greece in the folds of their clothes. Later halls pay tribute to several more global civilizations, taking us through Asian trade routes of the seventh century and the golden age of arts and sciences in the Islamic world between the eighth and tenth centuries, as well as the Portuguese navigators who explored the coastlines of Africa and the Indian Ocean in the 15th century. The gallery titled World in Perspective, introduces the Renaissance with La Belle Ferroniere (1495–99), one of only 15 Leonardo da Vinci oil paintings in existence and also includes Francesco Primaticcio’s bronze Apollo Belvedere (1541–43), loaned from the Palace of Fontainebleau in France, as well as Titian’s Venetian masterpiece, Woman with a Mirror (ca. 1515). The museum’s ongoing relationship with 13 French institutions is undoubtedly to be credited for the spectacular presentation, and notable loans can be found in every space. In the final three galleries, which cover the 18th, 19th, and 20th centuries, Claude Monet’s Gare St. Lazare (1877) is displayed alongside The Red Rock(1895) by Paul Cézanne as well as James McNeill Whistler’s Arrangement in Grey and Black No.1 (1871) or Whistler’s Mother as it is more affectionately known. Great lengths have been taken to make continual links across continents. A meditative Mark Rothko painting hangs alongside a color block piece from Sayed Haider Raza and an Alexander Calder mobile has been placed next to a Saloua Raouda Choucair sculpture—both explore movement and form. The museum closes with a contemporary room of works loosely linked around the theme of identity and territory. They circle around a 23-feet-tall glittering chandelier sculpture by Ai Weiwei. The Fountain of Light (2007), inspired by Tatlin’s proposed monument to the Communist International, is fragile as well as opulent. Visually, it also pays reference to the Tower of Babel, the biblical myth about why the world is divided into different communities who speak different languages. It is possible that a museum of this magnitude can propose new ways of communication to slice through the divisions made by language and culture? This is the Louvre Abu Dhabi’s claim. When the doors open on November 11 2017, the public will decide. This article was commissioned by ARTNews and was originally published on November 8, 2017.